I’ve seen the personalized labels from places like Name Bubbles for years. Marketed primarily as a way to label children’s belongings at camp, school or daycare, I had never seen the point. My kids don’t do any of those. 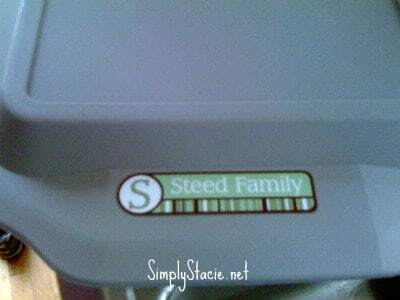 When I was asked to review personalized labels for Name bubbles, I requested ones that read Steed Family. I have found uses I NEVER expected since they arrived. For instance, last time I was at my parents house, I left my iPhone charger. Gone. Assimilated into my teenage step-sisters travel bag. 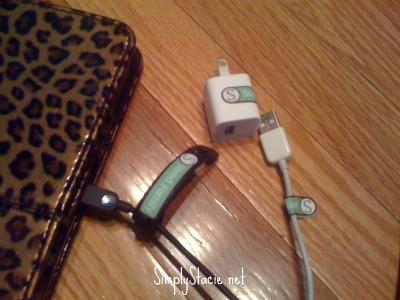 To prevent that from happening this time, I used the skinny labels on both the brick and the cord. I also put one on my touchpad charger. And the square labels with my phone number have found a home on our iPods, touchpads, and computers in preparation for our trip to Florida. Clothing labels have found a home in a set of sweatshirts from my dad. They have nearly identical ones and now we can tell which ones are ours. I’ve also added the larger labels to covers on frequently used potluck dishes. Name Bubbles labels are great because they are laminated — I’ve seen some places where laminating costs extra (NOTE – laundry labels default to laminated but are available without). They stick really well and the assortment I received was gender neutral yet still attractive for this girly girl. I’m in love! Don’t be put off by not buying these if you don’t have kids. 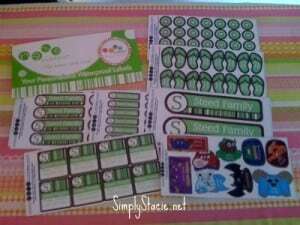 These are super durable, super useful labels! Visit Name Bubbles to view their patterns and packages. You will love them!